You have read the articles and the blogs. You’ve scoured the internet and watched YouTube videos. You’ve checked out Facebook and Pinterest. You’ve read The 36-Hour Day and other books. You have talked with countless medical professionals, perhaps even some “experts.” Maybe you even took a Dementia Certification class. Yet, you are having some real problems as a caregiver. Nothing seems to be working. The frustration and anger just keep building. You have no idea how long you can keep this up. Dementia is not one-size-fits-all. Absolutely not! First, there are many kinds of dementia. Some dementias, like the behavioral variation of frontotemporal dementia, start out with more behaviors than forgetfulness. Other dementias, like Lewy-Body Disease, have a pattern of up-and-down memory…so that it seems like the person with Lewy Body Disease is “doing this on purpose” (trust me, they are NOT!). You also have the added mix of personality! Many personality traits can be exaggerated by the dementia. The solid matriarch can become the tyrant who refuses to do anything. A skilled and compassionate expert in dementia care can help you enter the person’s reality by showing you how personality and disease simultaneously create the reality that the person with dementia is experiencing. “I know she has dementia. How do I handle her?” Some blogs and book chapters may be helpful and may improve your understanding of the specific behaviors you are dealing with - but do these venues provide strategies for managing (and decreasing) the behaviors? Many do not. Many provide very general advice when a care partner needs much more direction. 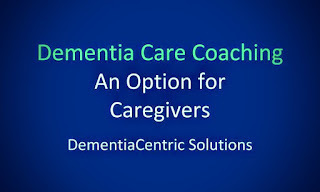 An expert dementia coach will listen to your situation and help you to “decode” the behaviors. Care partners have different learning styles. I am a visual learner. I need to SEE something to understand and apply it. Other people learn by listening. All adults, however, learn best when they know the rationale for something, when they know WHY something will work. This knowing of the “why” behind the “what” helps adults to transfer knowledge and experience from one situation to a seemingly unrelated new experience. 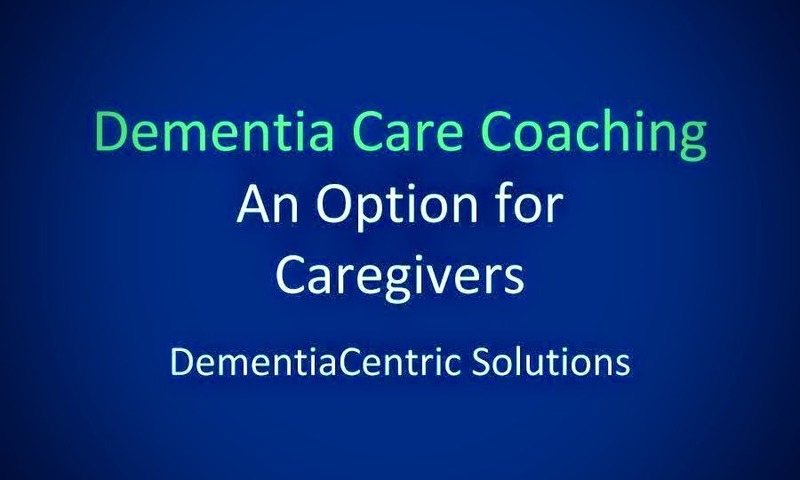 An expert dementia coach can explain the “why” of a behavior in such a way that you, the care partner, will have an epiphany about the behavior - and their meaning to a person with dementia. Just because it is “on the internet” does not mean it is quality information. It is great to have the internet as a resource. But a care partner for a person with dementia may find themselves quickly overloaded with the quantity of information, and have difficulty discerning the quality of the information. It is like trying to take a sip of water from a fire hose. An expert dementia coach with a strong foundation in neurobiology and intimate knowledge of the scientific literature around dementia care can help. He or she can provide you with high-quality, evidence-based, research-tested methods for decoding the puzzling behavior and helping you to adjust your own actions to avoid triggering future episodes of unwanted conduct. WHAT ARE THE QUALIFICATIONS OF AN EXPERT DEMENTIA COACH? Successful clinical experience working with people with dementia and their families. The longer the track record, the better. When I say “clinicians,” I refer to people who offer some type of direct, hands-on, clinical care. Clinicians include therapists, clinical psychologists, physicians, nurses, and nurse practitioners. Nurses and nurse practitioners usually make the best dementia coaches because of their excellent patient-teaching abilities, and their overall knowledge regarding the impact of health, disease, and medications on memory and cognition. Beware of people with only degrees but no formal clinical practice. Up-to-date knowledge of dementia from the scientific literature. Better yet, someone who is also a researcher (on top of being a clinician) has current knowledge of the literature AND a deep understanding of the various factors that can impact the development and progression of dementia. This is important because behavioral strategies that work are grounded in neurobiological principles. BONUS: Experience as a care giver for someone with dementia. I have noticed that clinicians who have never been in the role of caregiver often come across as condescending, judgmental, or preachy. I’ve examined various dementia certifications, and I know I am going to get some serious hate mail, but I am NOT impressed. I’ve looked at the curricula and all that is offered is generic information with very little practical application. I use a video-conferencing program, Clickmeeting.com. Once we set up a day and time, you receive a link from me. You can check your computer’s compatibility using that link. You can also download the free app on a tablet or cell phone and use those devices. We will be able to see and hear each other. I offer ideas and suggestions based on your unique situation. I am happy to speak with family care partners who want to explore this service with me. We can quickly determine if you will benefit. This is not a paid advertisement. Dr. Rita Jablonski has earned the Alzheimer's Reading Room Gold Seal of Approval. Dr. Jablonski, I am an independent caregiver, specializing in dementia care in NW Montana. I have recently begun teaching my workshop Dementia Care in the Home through our local Adult Ed program. I would like to go on with more community outreach, including dementia coaching services, but do not know what kind of credentials are required (if any...I'm always shocked at the lack of training in any job in this field). I am a CNA and have been Nationally Certified in Dementia Care. The caregiving crisis in this country is made worse in rural states by distance and low population, resulting in high percentages of our population with little access to caregivers, respite workers, or dementia educators for families. The high turn-over rate in our agencies result in scant training of professional caregivers. I would like to be an educator and coach. I am beginning the process of forging my next path, and write to you for any advice you would like to extend. Thank you so much. I am also looking to become a coach/educator. As a private care manager (with training and certification in clinical ethics) in Savannah, GA, I am finding that nearly ALL of my patients have some sort of dementia diagnosis and families are coming to my organization when they are at their wits end and desperate for help and in-home care. We are quickly learning that in order to help our patients/families more fully, we need to spend a lot more time on our own education in research. I am finding it rather difficult figuring out which certification or educational courses will be most beneficial for me as a care manager and which of those will help me to educate our CNAs and other care managers. It was helpful to read that Dr. Jablonski has found many of the certifications to be sub-par as they are quite expensive and I would have hated to buy in to something that isn't going to maximise learning! It would be much appreciated if you could pass along any info you find regarding worth while training and I will endeavour to do the same.